Finding cute sandals for large feet doesn't have to be a chore. With the advent of new technology, shoe manufacturers are able to produce stylish sandals for women with feet of any size. Decades ago, women with big feet were relegated to the 'ugly' sandal section of shoe stores. However, in recent years, ladies with large feet have been given a slew of stylish options that were once reserved exclusively for girls with smaller feet. What's more, newer versions of sandals made for women with large feet are not only cute, but they're comfortable as well. No more squeezing feet into narrow, strappy sandals bejeweled with rhinestones and gems. Today, ladies can choose from a wide array of sandals in a rainbow of colors, patterns, textures, features and sizes. Spandex: If you have wide feet look for sandals with stretch uppers made from Spandex. Wide shoes with this feature won't create or put pressure on existing bunions. Velcro: Look for pretty sandals with Velcro closures. The adjustable straps will allow you to loosen and tighten sandals with ease. Firm heel: Women with large feet should wear sandals with a firm heel counter to provide extra support. Arch support: Big feet need footwear with good arch support; look for sandals with a long vamp and a heel that measures between three-quarter to one-and-a-half inches, and no more. Space: Extra space should be the number one search criteria when shopping for sandals to fit big feet. Look for sandals that are roomy and can easily accommodate extra large feet. Size: Individuals with large feet should never go sandal shopping first thing in the morning. Feet swell as the day goes on, and your sandals need to accommodate this added size, so it's best to shop later in the day. If you have an eye for fashion, then you will appreciate the thick straps, gold accents and rich leather uppers offered by manufacturers that sell stunning sandals for women with large feet. Easy Spirit Christiana Sandals: Easy Spirit Comfort technology cushions and flexes like no other to accommodate large feet. The attractive sandal combines stability and style with a footbed constructed of thick, non-compressible polyurethane foam, which helps to reduce fatigue. The cute leather sandal comes in a variety of colors and features a hook-and-loop closure around the heel and over the forefoot for easy adjustability. Munro Brenna Sandals: These fashionable and functional sandals for large feet can be personalized to fit just right thanks to two fully adjustable straps across the instep and the lower vamp. The soft padded back strap prevents rubbing and adds comfort while the soft knit lining wicks away moisture and makes for a healthy foot environment. Propet Bliss Nina Walker Slides: The slide sandals offer women with big feet reason to smile. 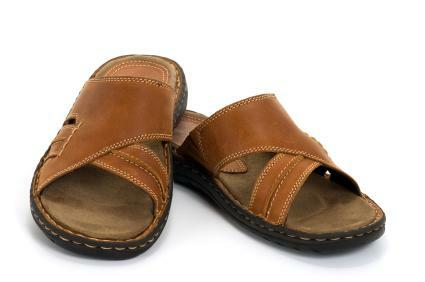 Not only are the leather uppers beautifully designed, but also the sandal is extremely comfortable. The footbed follows the natural line of the foot, secures the heel and arch and allows the toes to spread and relax in a natural position. Clarks Bendables Ina Heart Slide Sandals: These slides are ideal for women with large feet who need a cute sandal to wear from day to night. The Ina Heart Sandal is lined with suede and doeskin and features a super cute leather upper in a rainbow of colors. Some versions even have gold embellishments for more formal occasions. In addition to looking good, these Clarks feature thermoplastic rubber outsole, which resist slips, flex with your foot and works with the footbed to provide cushioning for safe steps. When shopping for sandals to accommodate large feet, be prepared to spend a bit more than you would on traditional sandals. In addition, most standard shoe stores will not have many sandal options for women with big feet. You will have better luck finding cute sandals by shopping at a specialty shoe store or online at sites, such as FootSmart.com, which caters to women with large feet.